Tom and Jerry: The Movie is a 1992 American animated Musical film starring the seven-time Academy Award-winning cat-and-mouse duo Tom and Jerry. Produced and directed by Phil Roman, the film stars the voices of Richard Kind, Dana Hill, Anndi McAfee, Tony Jay, Rip Taylor, Henry Gibson, Michael Bell, Ed Gilbert, David L. Lander, Howard Morris and Charlotte Rae. Produced by Turner Pictures and Roman's Film Roman, it is the first theatrical feature-length animated film featuring the cat-and-mouse pair as well as their return to the big screen after 25 years. Although largely mute in the original cartoons, the duo talked extensively in this film. Joseph Barbera, co-founder of Hanna-Barbera and co-creator of Tom and Jerry, served as creative consultant for the film. It follows the story about Tom and Jerry, who are homeless after their house was wrecked and eventually meets and helps a little girl escape from her child-hating, abusive aunt to find her lost father. After having its world premiere in Germany on October 1, 1992, Tom and Jerry: The Movie was released theatrically by Miramax Films and LIVE Entertainment on July 30, 1993 in the United States. The film was a box office bomb, earning only $3.6 million against a budget of $3.5 million and received predominantly negative reviews from critics largely for the film's use of dialogue for the characters, musical numbers, sub-par voice acting, dark content, lack of focus on the title characters and slapstick and similarities to Disney's The Little Mermaid and The Rescuers although the animation was mostly praised. 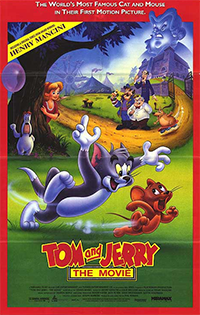 In the years since its theatrical release, the film later gained a cult following among audiences, mainly the Tom and Jerry fanbase however. This was also one of Dana Hill's final film roles before her death on July 15, 1996. While moving to a new house with their owners, Tom and Jerry get into a chase as usual resulting in Tom nailing Jerry inside his mouse hole with floorboards. Unfortunately, he misses the moving van and is forced to stay in the house after angering (Spike) a nearby bulldog. The house is then demolished the next morning with Tom going back inside to rescue Jerry, leaving them both homeless. Wandering through the city for shelter, the duo meet a dog named Puggsy and his flea friend named Frankie, and upon introducing themselves, speak normally for the first time. After a brief argument, Puggsy and Frankie persuade the duo to be friends. While finding food from some nearby bins for a feast, Puggsy and Frankie are captured by two dogcatchers while Tom ends up in a tussle with some mean singing alley cats, until Jerry saves Tom by opening a sewer pipe and tricking the alley cat gang into it. Later, the duo cross paths with an 8-year-old girl named Robyn Starling, who has run away from home since her mother died when she was still a baby and her father was killed in a recent avalanche while on a mountain-climbing expedition; she has been living with her evil guardian "Aunt" Pristine Figg, (who has proceeded to steal the family fortune), her sleazy, scheming lawyer and boyfriend Lickboot and her overweight dog Ferdinand, the latter requiring a skateboard to move around. Despite Robyn's misgivings, Tom and Jerry persuade her to return home. After Tom and Jerry end up in a massive food fight with Ferdinand and stumble across a telegram confirming that Robyn's father is still alive which Figg hides from Robyn, Figg sends them to an animal shelter run by Dr. Applecheek who turns out to be a cruel animal kidnapper and the true employer of the two dogcatchers who caught Puggsy and Frankie. Reuniting with Puggsy and Frankie in the cells, Tom and Jerry plan an escape, free all of Applecheek's captured animals (among them Droopy) and rush to tell Robyn the news. Elated, Robyn becomes determined to find her father in Tibet and they escape the city on a raft in the river but the raft is suddenly struck by a ship and they end up separated. Figg places a $1 million bounty on Robyn (which she has no intent on paying) while Robyn's father meanwhile is alerted of his daughter's situation and heads back to America to find her. Robyn is then found by Captain Kiddie, the owner of a failing amusement park to which he houses her until seeing an advertisement for the reward on a milk cardboard with the help of his parrot puppet Squawk, whereupon he traps Robyn on a ferris wheel and contacts Figg. Tom and Jerry then find Robyn and they flee in a paddle steamer as Figg, Lickboot, Applecheek and the dogcatchers arrive resulting in a long chase that ends with the dogcatchers ending up trapped in the ferris wheel and Kiddie and Applecheek being left stranded in the river. Tom, Jerry and Robyn arrive at Robyn's summer cabin built by her father, but Figg, Lickboot and Ferdinand have arrived there first. In the ensuing scuffle, a lantern is accidentally knocked over starting a fire engulfing the whole cabin. Figg, Lickboot and Ferdinand flee the burning cabin with Figg knocking the door down, but Lickboot unwittingly stumbles on Ferdinand's skateboard to which they fall on Kiddie's paddle steamer, that goes out of control after Ferdinand inadvertently moves the ship's rudder, sailing the trio away. Tom and Jerry manage to get Robyn to the roof just as her father arrives in his helicopter. Robyn is rescued, but her father is unable to reach Tom and Jerry in time before the cabin collapses. Fortunately, the duo barely survive and are rescued. In the aftermath, Robyn is finally reunited with her father and takes Tom and Jerry in as her pets. Just when it appears that they have found friendship however, Tom and Jerry resume their antics once Robyn is out of sight to which the film ends as the duo chase each other once again. "Finale (Friends to the End)"
A soundtrack album was released by MCA Records in 1992 and included both the songs (music written by Henry Mancini with lyrics by Leslie Bricusse) and score from the film, composed by Henry Mancini. The end credits pop song All in How Much We Give was written by Jody Davidson. All tracks written by Henry Mancini. 8. "Theme from Tom and Jerry (Main title)"
14. "Escape from the Fire"
15. "Finale (Friends to the End)"
16. "Tom and Jerry Theme (Pop Version)"
Review aggregation website Rotten Tomatoes gives the film a 17% approval rating based on 12 reviews with an average rating of 3/10. Joseph McBride of Variety gave the film a negative review, saying that "Tom and Jerry Talk won't go down in film history as a slogan to rival Garbo Talks." Charles Solomon of the Los Angeles Times panned the film's songs and Phil Roman's direction. Hal Hinson of The Washington Post criticized the dialogue between the cat and mouse and said that the voices "don't fit the characters". Hinson also complained that the musical numbers are "as forgettable as they are intolerably bouncy and upbeat". Gene Siskel and Roger Ebert awarded the film "Two Thumbs Down" on their show Siskel & Ebert. Although they praised the animation, look and the truthful art design of the animated shorts they neither thought that it was a good idea to give dialogue to the two characters, giving lack of more slapstick action from past cartoons and that the story was silly even considering that the character of Robyn Starling takes most of the attention than the cat and mouse themselves. Conversely, Vincent Canby of The New York Times was more positive in his review, praising Mancini's score and the musical numbers to which he later went on to say that "[the characters of] Tom and Jerry have charm." Tom and Jerry: The Movie opened theatrically on July 30, 1993 in the United States and Canada alongside Rising Sun, Robin Hood: Men in Tights and So I Married an Axe Murderer. Ranking number fourteen at the North American box office, the film grossed $3,560,469 worldwide making it financially unsuccessful. A video game based on the film was released for the Sega Master System in 1992 and Sega Game Gear in 1993, followed by a handheld game by Tiger Electronics released the same year. A video game based on the film of same name titled Tom and Jerry: Frantic Antics was released for Game Boy and Sega Genesis on 1993 by Hi-Tech Expressions and Altron. The film was released on VHS and Laserdisc on October 26, 1993 by Family Home Entertainment. The VHS release of the film was reissued on March 2, 1999 and was released on DVD on March 26, 2002 by Warner Home Video although despite receiving a UK VHS release from First Independent Films, no Region 2 DVD release is as of yet currently available. As of 2019, the film has also yet to be released on Blu-ray and in its widescreen format. ^ a b c "Tom and Jerry: The Movie". Box Office Mojo. Amazon.com. Retrieved November 22, 2008. ^ a b Barbera, Joe (1992). My Life in 'Toons: From Flatbush to Bedrock in Under a Century. Atlanta, GA: Turner Publishing. pp. 234–239. ISBN 1-57036-042-1. ^ "Tom and Jerry: The Movie [Original Soundtrack] - Henry Mancini - Songs, Reviews, Credits - AllMusic". AllMusic. ^ "Tom and Jerry – The Movie". Rotten Tomatoes. Flixster. Retrieved September 11, 2017. ^ McBride, Joseph (October 1, 1992). "Review of Tom and Jerry: The Movie". Variety. Reed Business Information. Retrieved September 11, 2011. ^ Solomon, Charles (July 30, 1993). "Movie Review: Tom and Jerry': A Bland Cat-and-Mouse Chase : The formulaic story feels like a rerun and borrows characters from many other classics". Los Angeles Times. Retrieved October 7, 2011. ^ Hinson, Hal (July 30, 1993). "Tom and Jerry". The Washington Post. Archived from the original on December 1, 2017. Retrieved October 7, 2011. ^ Canby, Vincent (July 30, 1993). "Movie Review – Tom & Jerry: The Movie". The New York Times. Retrieved October 7, 2011. ^ "It's Tough to Stay Afloat in the Film-Cartoon Biz : Movies: Disney's hits prove that it can be done, but other firms lack marketing savvy and a competitive product, animators say". Los Angeles Times. Retrieved 2012-05-29. ^ "Tom and Jerry the Movie [VHS] (1993)". amazon.com. Retrieved 25 January 2012. ^ "Tom and Jerry – The Movie (1992)". amazon.com. Retrieved 25 January 2012. Beck, Jerry (2005). The Animated Movie Guide. Chicago: Chicago Review Press. ISBN 1-55652-591-5. pp. 284–285.